Learn how to scan documents using and NLP library and then turn that data into interesting visualizations using big data techniques. Alchemy is a philosophical and proto-scientific tradition practiced throughout Europe, Africa, and Asia. Its aim is to purify, mature, and perfect certain objects. In popular culture, we often see the case of shadowy figures trying to turn lead into gold to make themselves immensely rich or to ruin the world economy. In our case, we will not be transmuting lead into gold, but documents into graphs which is just as good. In the past, we had used "Alchemy API" but they were purchased by IBM and retired. You can get similar functionality with IBM Watson, but let's do something else instead. 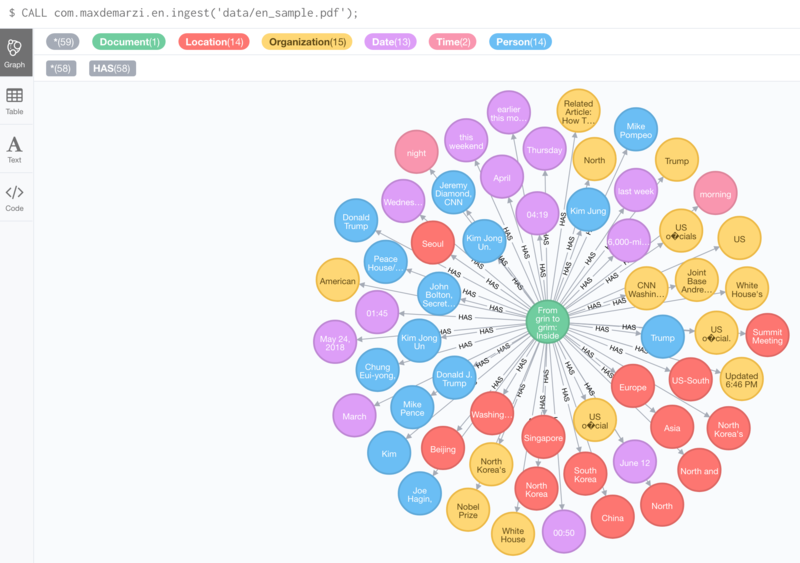 Let's add Entity Extraction right into Neo4j. 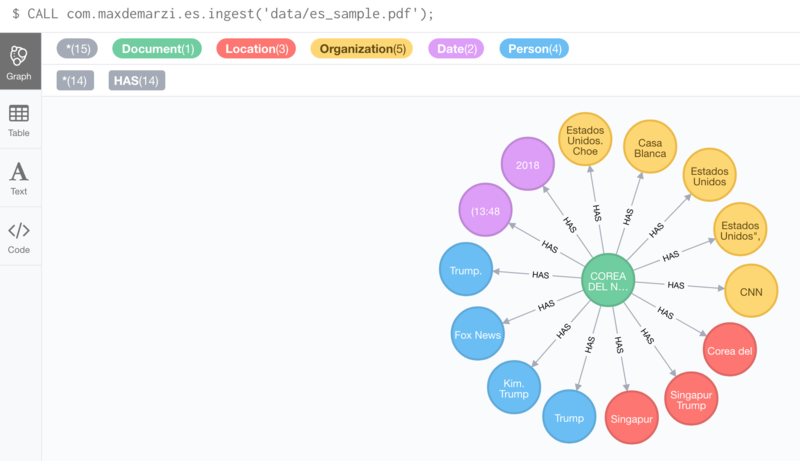 The concept is to take a document, be it a text file, word file, pdf, powerpoint, excel, etc., and have Tika detect and extract metadata and text, then run that text through a set of NLP models from OpenNLP to find interesting Entities. Let's go ahead and build a stored procedure. If I think I may have too much in the stored procedure itself, sometimes I just make a callable and stream the results. That's all we are doing here. There is one big spoiler in here already in that we are going to ingest documents in more than just English. We don't know what the filetype of the document is going to be so we will use an AutoDetectParser to deal with it per these instructions. With our text in hand, we can use an OpenNLPNERecogniser to find interesting entities and store them in a map. I'm choosing between two languages here but, of course, you could add more. So wait, what are ENGLISH_NER and SPANISH_NER anyway? They are OpenNLPNERecogniser objects that take a map as input which directs them to the locations of the language files of the pre-trained models. You can find more pre-trained language models on the web or you can train your own. With that out of the way, let's get back to our procedure. We first go ahead and create a new document node with our text, file name, and language. Then we add it to our list of nodes to return in our result set. Then for every type of entity our language model recognized, we check to see if the entity already exists, or create it and then add a relationship from the document to this entity. We add our entity and relationships to our result sets as we get them and finally we call success to make sure our transaction gets committed. Sweet! It looks like we could use a little disambiguation and some cleanup, but this is enough to get us started. The source code as always is on GitHub. Be sure to take a look at the Tika documentation to learn more about what it can do. 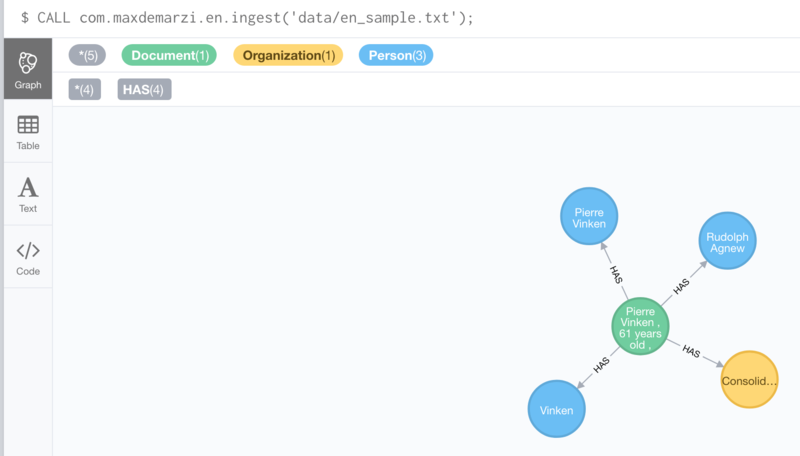 Finally, if you want to see a plugin with more NLP functionality check out the work our partners at GraphAware have done with their Neo4j NLP plugin.